Why are we suddenly talking about the White House press briefings? The White House has made the decision to keep the press briefings off-camera with increasing frequency, which means streaming and cable networks can't always show them live. This comes after months of high ratings for the briefings, usually conducted by White House Press Secretary Sean Spicer, or sometimes, his deputy Sarah Huckabee Sanders. Some networks, including CBS News, have since begun sending professional sketch artists to cover the briefings. This has lead to a series of courtroom-style sketches of Spicer addressing reporters, often in front of cameras that the White House forbids from being turned on. The press conferences are still on-the-record, which means reporters can quote from them freely once they are over. Tuesday was the first day in over a week that cameras were allowed to broadcast the briefing. If the ratings were high, why is the White House putting them on camera less often? 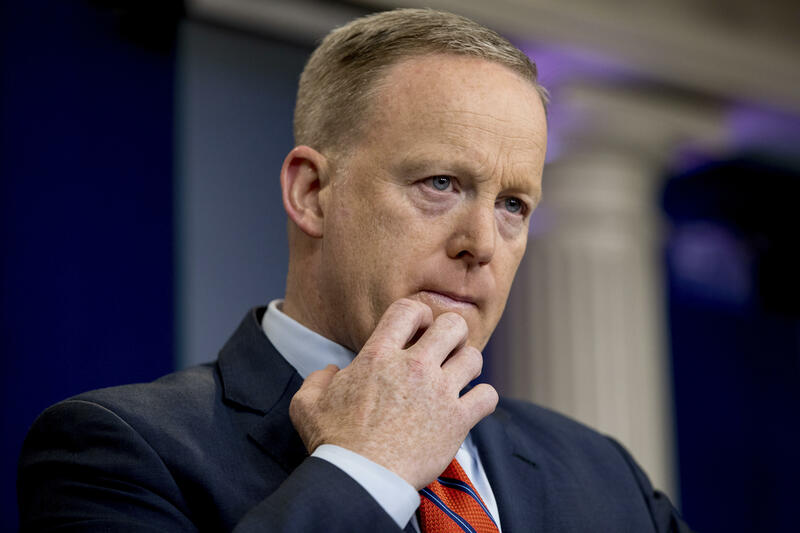 That's something of a matter of speculation, although Spicer has had some noteworthy bad days on the podium, such as the time he mistakenly insisted Adolf Hitler hadn't used chemical weapons. When asked by The Atlantic last week why the on-camera briefings were becoming less frequent, senior White House strategist Steve Bannon replied "Sean got fatter" -- presumably in jest. Is the Trump administration breaking with tradition by keeping the briefings off camera? Yes and no. On camera press briefings only started in the 1990s, when Mike McCurry, President Bill Clinton's press secretary, started letting the networks televise them live. For what it's worth, McCurry now says this was a bad idea. "The daily briefing has become less than helpful, and I bear responsibility for that because I let it become a televised event. It should not be," he told Politico late last year. How did the White House brief before that? Until the 20th century, presidential administrations tended to keep the press, which was often overtly partisan, at arm's length, and the position of press secretary didn't really exist until Herbert Hoover's presidency. Before that, relations with the media were a more informal affair, with one of the president's top aides tending to reporters, in addition to performing other duties. White House reporters themselves didn't really exist until The Washington Evening Post's William "Fatty" Price started hanging around the building in Grover Cleveland's second term. Other papers soon followed suit, sending their own reporters, who eventually had their questions fielded by a presidential aide. Theodore Roosevelt became the first president to really embrace a working relationship with the press, according to Time Magazine, regularly talking with reporters during his daily afternoon shave. The more reserved Woodrow Wilson, on the other hand, initially welcomed questions from the press only to find them "irrelevant" and "tiresome," according to the White House Correspondents' Association. Wilson also held the first modern press conferences, although he would only answer questions off-the-record and refused to be quoted. Oddly enough, the famously taciturn Calvin Coolidge was much more accessible, holding 521 press conferences over his six years in office. "I regard it as rather necessary to the carrying on of our republican institution that the people should have a fairly accurate report of what the president is trying to do, and it is for that purpose, of course, that those intimate conferences are held," Coolidge said in 1926, according to the White House Historical Association. When did presidents start dealing with the press like they do today? Franklin Roosevelt loved talking to reporters, who were made readily available to him by press secretary Stephen Early. Roosevelt held over a thousand press conferences, according to the White House Historical Association – a record that stands to this day -- in a sense doing part of the job that we associate today with press secretaries. But it wasn't until Dwight Eisenhower took office that they were shown on television, albeit in packages -- essentially produced by the White House -- that edited out questions Ike's press handlers disliked, as Time Magazine wrote at the time. Did relations between the White House and the media become any friendlier over time? If anything, the opposite happened. Richard Nixon loathed the press, a feeling he made clear during his concession speech after losing the race for California governor in 1962, in which he lambasted the reporters in the room. And he's the reason we have a special press briefing room in its own separate building, which was once the White House pool. Nixon, who toyed with the idea of just abolishing the position of press secretary altogether, didn't like reporters hanging around the West Wing. So he just put a floor over the pool and had his spokesman, Ron Ziegler, deal with them there. The briefing room would later be named after James Brady, who was Ronald Reagan's press secretary until he was gravely wounded when a gunman opened fire on the president in 1981. Gerald Ford would later install another pool on the White House grounds, while the original press briefing room is now the office of the national security adviser. How often do presidents themselves speak to the press? Today, presidential press conferences are less common then they have been in the past, in part due to the more adversarial relationship between media entities and the White House. According to presidential scholar Martha Joynt Kumar, Barack Obama held only 79 press conferences, while George W. Bush did 89, Bill Clinton did 133, and George H.W. Bush did 143.